...& other fluffy love cessions I'd softly like to get, all muffled in some KNITTEDCOAT treasures....he probably loves also to dive in...? 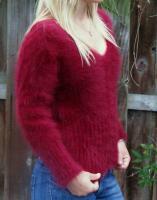 for convenient walk outside or private fluffy love cessions CYNTHIA-KNITWEAR's wonders stay the must for all day & night long ! ! even if I'm in extra hairy mohair... I'd like to experiment & be initiated in angora flufiness with & by DJL101057 ! Wont you love too ? ... of course totally covered & softly well muffled in ! as wrote above some of SUPERTANYA's fuzzy wonders should be the very first layer I'd love to feel right on my bare skin ! STAY WOLLY & HAVE A NICE FLUFFY WEEK END FULL OF LOVE & SWEETNESS....IN MOHAIR OR ANGORA TOO !